You are making general inductions from two examples that represent noise trading. naturally there would be affected by noise in closing prices. But you conclusions do not apply to all strategies. Look at the cumulative return of the first strategy: it is only +0.8%. This is noise and will be affected by small changes in closing values. The same holds for the second strategy: 0.35%. It is not the closing price, it is the strategies you are testing that have the problems and the data just tell you that. I challenge you to do the same for a moving average cross over system in S&P 500. Will you get any significant differences? The conclusions from your article is about the strategies, not about the data because the future can be different than the past. In other words the conclusion should be: Beware of noise trading. I am afraid you have misinterpreted the cumulative returns of the first strategy: it is over 60%, not 0.8%. Also, the third strategy is given especially in anticipation of some readers who would object that this phenomenon only applies to mean-reversion strategies ("noise-trading" in your parlance). That is a momentum strategy, and if it were to rely only on noise, it would not have generated any positive returns when backtested with 1-min data. Noise kills that strategy, but noise is not the profit driver. We trade live a highly profitable mean-reverting strategy, so I believe "Beware of Noise Trading" would not be an accurate portrayal. Yes Sir, 60%, sorry for the typo, but in 7+ years, averaging less than 10% return. This can be noise trading. You should be able to find many such strategies that are sensitive to variations in the closing price. You are committing to a logical fallacy here of generalization. You should not trade any strategy that is sensitive to noise in execution price. Actually what you have proven is that some strategies are sensitive to variation in prices. You have not proven that ALL strategies are sensitive and that high freq data are required to test them. Do you think that a strategy that trades twice a week QQQ with about $2 PT/ST should be back-tested on millisecond data? Please if you think so, say it. My article is not a mathematical proof. I do not claim that ALL strategies require 1-millisecond data. I said you should carefully consider if yours does require such data. The CEF strategy trades only once a month, yet it requires 1-min data to backtest economically, unless you have expensive Bloomberg or CRSP subscription. So yes, if you trade QQQ twice a week at the close, you do actually need 1-ms data to backtest without Bloomberg/CRSP. Ernie, thanks for this post. Would you mind posting some performance figures (Sharpe etc) on the intraday futures momentum strategy you mentioned? I ran this on 35 commodities over 10 years using minutely data and I'm afraid I do not get anything remotely looking like a good strategy - at least with these parameters. In fact, some commodities such as Beans likely show opposing behaviour, whereas for other commodities (RB, NG, CL, etc) it appears to be mostly noise. Are there any details that I am missing? Let me know - If you prefer, I can also contact you via email. Applying the futures strategy to GC from 201001-201312 using 1-min data backadjusted contract data from eSignal, we obtained a Sharpe ratio of 1 and APR of 18.7%, assuming 0 transaction costs. What kind of execution lag are you using? I would guess a strategy that is robust to a full day lag would be more robust to this sort of error than one that is only robust without a trading lag. E.g., how would the strategies you showed work if there was a 1-day lag, but still using daily data? If your trading is successful why do you need to travel around the world and why do you need to insert affiliate links in this post to make commissions from the vendor selling the HF data? I know people who are trading and have no time to go for a walk while you travel constantly to give seminars. As far as this post, nothing is clear, nobody can confirm your findings and claims. Also, the strategies that execute at the close try mostly to arbitrage close price anomalies and are naturally very sensitive to variations in price. I would think a batter idea would be to avoid such strategies. I am not sure what exactly you meant by an execution lag. As I mentioned, we only use prices within the previous trading session (up to the most recent open outcry close) to generate signals. If you would like to look at our trading track records, please visit epchan.com/accounts. We can provide brokerage statements to prospective investors with serious interest. Our commodity pool's track record is audited and filed with the NFA, and also available for your review on request. If you believe that successful fund managers should forgo revenue generated by their blogs, seminars, or books, you might wish to also contact best-selling author and fund manager Mr. Joel Greenblatt. He manages multi-billion dollars of assets, so by your logic he should give away his books free of charge. Regarding the strategies described in this post, everyone can verify if my conclusions are correct or not. The strategies are fully described either here or in my second book or in the cited and published journal article. Please feel free to backtest using consolidated EOD data vs official close and see the differences for yourself. Finally, regarding QuantGo: yes, I think their business is great and I do wish to support them by providing links. Our fund is a customer and we want them to prosper so that we can continue to benefit from their service. But you don't need to use QuantGo at all to backtest the first two strategies. You can subscribe to Bloomberg. For the third strategy, you can buy 1-ms data from tickdata.com instead. In a similar vein, I support all new businesses that enhance trader productivity such as Quantopian or Rizm or Marketcetera etc., to all of whom I have provided links previously. Hi Ernie, thanks for your post, I am concerned about the point regarding the 3rd issue. What was the percentage difference between the returns shown by per minute data, and those for live (or for with per ms data). I have generally been concerned with backtest results - but I continuously check actual broker execution prices against the data provider's prices which are per minute, and the inevitable difference is something I consider part of the overall transaction cost - the difference being a kind of slippage. The cost, though not negligible, is not that high. Have you used per minute prices for your mean reversion strategies in the past? Also, for the flip flops case, was there a need felt to have minimal difference between the 95 percentile price and the last price etc.? 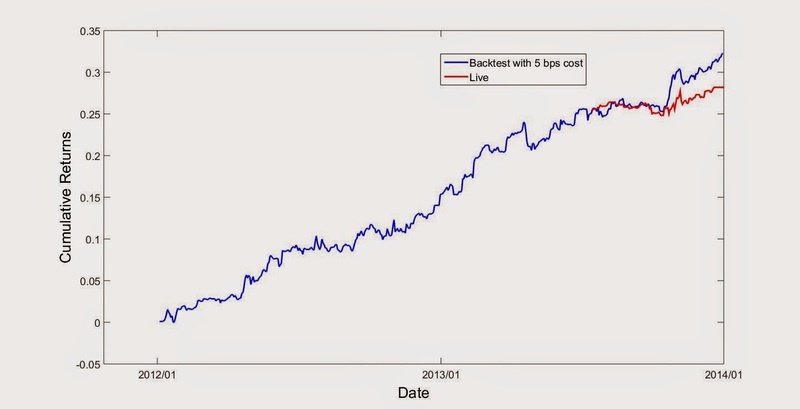 The backtest return using 1-min data, as I wrote above, is 18.7%. The backtest return using 1-ms data is negative. The issue for the 3rd strategy is not slippage, but the flip-flops. We certainly used 1-min data to backtest before, but now we don't due to the issues we discovered. I am not sure I understand your question about the minimal difference between last price and 95th percentile. My question for the minimal difference was that assuming a lower bound like 4 to 5 basis points could prevent a noise influenced conclusion - not sure if it is a useful idea - I was just wondering. While I respect your desire for privacy when making anonymous comment, I do suggest that you sign it with your first name, or a nickname. That will make reading a Q&A thread that much easier for everyone. No, I don't think entering a few ticks above 95th percentile will change anything. Please note that the strategy does not exit whenever the price drops below 95th: it only exits when it drops below 60th. So the flip-flop is not a matter of just a few ticks' changes. Hence the name "mini flash crash". The change of just a few ticks won't constitute a crash. Hi Ernie. Thanks for the insightful, practical-oriented books, blog, and also some of your excellent comebacks in this particular thread... While the gotchas in the first two strategies are intuitive, I find the futures momentum one a bit surprising. Instead of using quotes or 1 min bar trades, couldn't you just use all trades (all ticks), excluding quotes? The strategy would be exactly the same, but you would have to test using either a) a fixed cost measure for implementation shortfall, b) execution lag (i.e. trade on lastpx at T+50ms) or c) both. I find quote data has inherently lower quality and higher degree of errors, and I would be very hesitant to use it in a strategy without proper cleaning and validation. Depending on the alpha decay in the strategy (shouldn't be too bad for this one), various clever execution approaches can minimise the total cost (slippage, opp. cost) and providing a small and fairly deterministic (over time) tracking error to sim. Yes, we can rank trades instead of quotes, but the result won't be very different. And indeed, smarter execution strategy with a lag may help avoid some instances of flip-flops, but not all. The key problem with this strategy is not slippage, but the sudden move and reversal of the BBO and the corresponding trades. "This account has a leverage of approximately 10"
"and the client’s managed account will need similar leverage to achieve comparable results as the pool’s account. " So you are basically a gambler because only gamblers take such risks. If your returns are adjusted for a more reasonable leverage then there are dismal. I just warn you kindly that with these leverage levels there is risk of total loss. But wish you good luck at the same time. I hope your good luck continues. Most FX trading strategies apply higher leverage than is customary for equity strategies because the daily movement of currency rates for major pairs seldom exceeds 1%, and never exceeds 3%. (We do not trade pairs that are pegged by central banks, such as EURCHF or USDHKD). So even at 10x leverage, 3% loss translates to 30%, hardly a "total loss" that you are concerned with. Besides, we have stop losses at much lower levels. Even more risk-averse investors who choose a 2.5x leverage will still enjoy nearly 10% annual return - hardly a dismal number. If you do not wish to invest in any leveraged strategies at all, then please don't go near quantitative trading strategies or hedge funds. Investing in the SPY, with its sometimes decade-long drawdown duration, might be more suitable for your taste. I am curious that after Swiss National Bank abandoned the ceiling on 15 January 2015, does franc still peg euro or dollar? Swiss franc was never pegged to USD, but it was pegged to EUR. However, it was unpegged after January 15, 2015. See http://www.economist.com/blogs/economist-explains/2015/01/economist-explains-13. Interesting article! Thank you very much. I agree that it would be hard to ever trust SNB again! I've read your books and followed your blog for about a year. I get the impression (which may be inaccurate) that you've thrown a lot of strategies aside and are focusing on the forex strategy in your commodity pool, which looks like it has performed very well. I've tried a number of strategies, no holy grails, and the approach that seems to be taking shape for me is to find enough mediocre but still positive strategies so that the portfolio Sharpe is acceptable even if the individual Sharpes are shaky. Do you have any thoughts on this philosophical question of the holy grail vs. diversification? That is, the approach of "most strategies are disappointing so keep looking and when you find one that works, pile into it" vs "most strategies are disappointing but you can combine them into a whole that is better than the parts (as long as they're at least positive)"? Do you trade minor currency, SEK, NOK, and/or DKK? Are they risky to trade? Thanks. FX is indeed the most profitable strategy that we have traded, and that's why we are offering that to Managed Account clients. However, we do trade a variety of other futures and stocks strategies in our commodity pool for the purpose of diversification. The strategies in the pool are traded at much lower leverage than the one in the Managed Account. The pool is also performing well - up over 4% net in Q1. Diversification of strategy is always a good idea. As you pointed out, uncorrelated strategies always increase the portfolio Sharpe ratio. Of course, one should continue to look for higher performing strategies at the same time. There is no contradiction between the two. We do consider NOK a commodity currency, and thus it is included in our consideration. We also used to trade SEK in a different strategy, but not at this time. DKK is pegged by the Danish Central Bank. We don't trade pegged currencies. I read your books and have your blog on me feeder. I have to thank you for all the invaluable tips you have given us over the years. You have been more than generous with the information and I find it great that you not only share some of the things you know but make sure the little guy can try them too for a reasonable price. I use moc orders from time to time and was quite surprised when you said the primary and consolidated closing price are different. What I have seen in my personal experience is that they are the same. So I did a little test with a bloomberg terminal. I took the first 50 companies in the sp500 and got the closing prices for the last ten days. I not only got the prices from the primary exchange but the consolidated too and then I took the closing prices from google finance. This means we had 100 comparisons (50 primary vs consolidated and 50 primary vs google finance) each day and for a total a 10 days that gives us 1000 comparisons. Now I took the differences in prices and added everything together from both comparisons... results: $0.00. I might be doing something wrong because it looks pretty simple and straightforward. Have you tried this in bloomberg? and if so what commands did you use? p.s some times there are little differences, for instance if you check MSFT on the 15th on april you see that the closing price was 42.255 (http://www.nasdaq.com/symbol/msft/historical). That is on the nasdaq website and also in bloomberg but in google you see 42.26, probably because of rounding errors. From 201001 to 201412, there are 200 dates when the auction price and the consolidated price are significantly different for AAPL. E.g. We don't subscribe to Bloomberg anymore, but I remember they use a different suffix (.P? .N?) to indicate primary exchange prices. Ernie - should we conclude that losing money to flip-flops is due to higher frequency players that are aware of these strategies and can game them? The consensus is that this is due to HFT, but I don't know that we can conclude HFT is able to profit from this, or whether it is just a side-effect. The closing price on Nasdaq for AAPL on 2014-10-28 was 106.74. The 106.71 comes from arca, bats or edgx. I would double check the data source if I had money on the line. Would you say there are any problems of going short emerging market currencies? For example in the forward market? You can go short EM currencies very easily in the spot market. Why would you need to go to the forward market? Some EM currencies are very liquid. Well, the forward market will give you the implied interest-rate differential which the spot market will not. We trade very short term strategies, so the differential interest rate doesn't matter to us. Do you trade CFDs? What is your comment? Thanks. No, US investors are not permitted to trade CFDs. Hello Ernie, you mentioned EM currencies. Can you comment on the liquidity for USD/NOK vs EUR/NOK? Also, does your team consider CZK, HUF etc.? We do not trade CZK and HUF. Do you do arbitrage between an ETF and part of its component stocks using cointegration? What is your comment? Many thanks. Does that mean the out-of-sample performance is not very good? Besides XLE and SPY (your new book), have you tried other ETFs? Thanks. That's right: out-of-sample performance is much worse than in-sample. I may have tried one or two other ETFs, but the general conclusion is the same. When we use trade price to backtest a strategy, usually how many ticks do we consider for bid-ask spread and slippages for liquid stocks in US market? The spread is highly stock-dependent, even for "liquid" stocks. If measured by ticks, it will vary widely depending on stock price. So it is more sensible to measure it by basis points. 1 or 2 bps are common for SPX stocks. Thank you for sharing the article, "Trader Charged With Manipulation That Contributed to May 2010 ‘Flash Crash’". I believe that there are other HF traders doing the same things. Does that mean limit order books are not reliable for short-term trading since HF traders can manipulate them? Thanks. Nav Sarao, the trader who allegedly "caused" the flash crash, is far from a HFT. By his own admissions, he point-and-click trades. Limit order book in the stock market is, however, highly subject to manipulation. Half of my MFT course is about the different kinds of manipulation people do, and how to protect yourself against them. Do you know any "real prop trading firm" in the world? "real" means they do not make money from their traders. Thanks. If by "not making money from their traders" you mean they do not charge their traders monthly fees, exorbitant commissions, etc., then yes, there are such prop trading firms. In fact, most HFT shops belong to this category. But these firms only hire traders with demonstrated track records. Sorry for the late reply about the AAPL closing price on 2014-10-28. It took our analysts quite some time working with QuantGo to figure out what's going on. On that day, the Algoseek tick data is mysteriously missing the Nasdaq auction tick, so our algorithm picked the next biggest (largest volume) auction, which is on ARCA with price=$106.71. We have alerted Algoseek of this problem and they are looking into why the Nasdaq tick is missing. On the other hand, it is certainly not true that consolidated closing prices and official (auction) closing prices are always the same. Looking at AAPL on 2010-04-27, for e.g., Nasdaq auction close is $262.26, while the consolidated close is $262.04. Do you agree based on your Bloomberg prices? For HFT shops, do you mean their latency is less than 1 ms, and they trade with co-location? Many so called prop trading firms also ask their traders to pay risk deposits and training fees. I think they make quite good risk-free returns from their traders. Yes, by HFT shops I meant those that need to have < 1ms latency. These shops hire traders as employees, and will share profits and sometimes even pay salaries. They of course charge commissions from their traders, but do not charge desk fees. A good example is Hudson River Trading. May I ask how your old boss makes so much money? What is his trading strategy? Thanks. Millennium Partner operates almost like a fund of funds. They hire lots of traders, and everyone has some capital allocation and trade their own strategies as they see fit, (subject to risk constraints of course). No collaboration between traders are expected nor encouraged. May I ask why your FX managed account has only 5.88% return in 2013? Is there any way to improve it? Thanks. Many investors wondered what happened to our 2013 net return which, as you pointed out, were just 5% or so. The answer is that it has nothing to do with our strategy - it has to do with the entire FX market that year. Irrespective of currency pair, the volume and volatility of the market reached a low that is unseen in recent years. Large FX hedge funds such as FX Concepts went out of business, further draining liquidity. (See http://www.reuters.com/article/2013/12/19/us-forex-hedgefunds-idUSBRE9BI0P720131219). But just as suddenly, in mid-2014, volume returned, and all became normal again. Hi Ernie, I think you indicated this in a comment some time back - but wanted to confirm, you do use a VPIN like check against fx tail events, with IB snapshot or a related data source? 1) Many FX brokers do not show you the volume, at least in a timely manner. So we can't use VPIN directly for FX. 2) There is no such problem in the futures markets. If your strategy is to trade once per month and the difference between consolidated and auction price is as reported on example above around 0.1%, thus having such a big difference in performance is a bit weird, isn't it? Is it due to the leverage? In addition, does the bias between the two prices is correlated with strategies used? It seems to me that bias works always against the strategy. The example above used AAPL, the most liquid stocks. A typical CEF is far less liquid, and the difference between auction and consolidated price is likely far higher than 0.1%. Furthermore, the CEF reversal strategy picked the outliers in returns to form the monthly portfolio. Hence it often picks those stocks with consolidated prices that are especially different from the auction prices. The average difference is not applicable here. If we set up a capital management, LLC as an investment adviser in IB in US, how much corporate tax do we need to pay? Could we set up the same company in IB in some tax havens? Thanks. LLC is a pass through entity: it does not pay any tax. It is a misconception that one needs to incorporate in a tax haven to avoid US tax on a fund or management company. So adviser will pay US personal income tax? Thanks. Are your presentaions on A.I and Portfolio Optimization (Kelly formula) from the Q-Trade Bootcamp available please ? BTW - see you tomorrow at the Meetup. Can a US financial advisor take clients who are not US residents? Please follow @QTradeBootcamp on Twitter. They will announce when the presentations will be available on their e-learning platform. Yes, US financial advisors can definitely take on non-US clients. Some job ads that I've seen require quant traders with a sharpe ratio of at least 3. Do you think that is a realistic expectation? How common is that kind of performance? It is not difficult to get a backtest with Sharpe ratio of 3, it is very difficult to get that in live trading over, say, 3 years, unless one is a high frequency trader. Focusing on Sharpe ratio wholly overlooks the hidden tail risks. It preference mean reversion strategies over momentum strategies for no rational reason. It is, in short, a very unwise selection criterion. If a trading firm advertises such preference, you know it is run by amateurs. Hi Ernie, Your last comment is interesting - if one did have a way of generating momentum strategies - any selection scheme even indirectly influenced by a Sharpe ratio will prefer mean reversion strategies over those. Can a mean/recent_drawdown estimate work better in this selection? One can use Calmar ratio to select strategies. Then mean reversion strategies won't be favored over momentum ones. If you find a strategy that works, do you always want to have a reasonable economic story behind it? Or if you find a statistical pattern that is robust across asset classes, time, and geographical markets, would you still trade it even if it is impossible to come up with an explanation? I typically prefer to have an economic story behind it, so that I know when it stops working, whether it is due to noise or whether the fundamentals have changed and I should just discontinue it. However, I also hear Bob Mercer over at Renaissance Technologies said that one of his best strategies has no fundamental basis whatsoever, and because it seems so arbitrary, no one else trades it and therefore it remains profitable throughout the years. A question regarding construction of strategies. It seems like if I make my strategy beta-neutral, it will not be zero cost. And if I make my strategy zero cost, it will not be beta neutral. How do I make my strategy both cash and beta neutral? But then, a small net exposure won't harm you either way! I know that sharpe ratio is constant with leverage. But is it true that calmar ratio will not be constant with leverage? Calmar ratio involves the calculation of cumulative compound returns. Compound returns are not proportional to leverage. The numerator and denominator do not involve the same compound returns. Hence the ratio is dependent on leverage. Everyone says that Sharpe ratios should only by computed on zero-cost portfolios, i.e. on excess returns. Why is that? Sharpe ratio measures risk-adjusted returns over and above the return on cash (i.e. cash is the benchmark). Hence we must subtract the risk-free-rate which is the return on cash. Equivalently, you can long the securities and short (borrow) the cash. If your portfolio is long only, then you should use information ratio, which uses a different benchmark (SPX? NDX? Some bond index?) return which you should subtract from. I should also clarify that if your portfolio is zero-cost, that means you don't need to short cash, and you won't need to subtract the risk-free rate from the returns in computing Sharpe ratio. As I understand it, a futures contract is a zero-cost instrument. Returns on a fully collateralized futures position can be written as an excess return. Hence, we can simply use Sharpe ratios for any strategy that involves futures. Correct? You can use Sharpe ratio for any portfolios. The only issue is whether the portfolio is zero-cost, in which case you don't need to subtract risk-free-rate from your returns. A futures portfolio is zero-cost, and risk free rate need not be subtracted. I have a strategy where I every day take positions and hold them for three days. Which way is correct to compute returns? In 1), returns are basically rolling three day returns for every new position taken. In 2), daily returns are computed for a fixed weight vector even though you only realise the return after three days. I have ret(t+1:t+3) on the right hand side of the equality sign since there are overlapping positions taken every day. Neither way is correct, but the second way is more wrong. In both ways, you are assuming that the capital allocation to each "stock" is constant - but unless you actively rebalance the positions at the end of each day, that won't be true. You need to specify shares instead of market value weights to compute returns. The second way is more wrong because the (net) returns cannot be added - they need to be compounded like (1+r1)*(1+r2)-1. If you want to add, you have to use log returns instead. Thanks for your reply Ernie. I see why the second way is more wrong. Do you have a code example in your latest book that takes this into account? As I pointed out above, the cumulative returns of r(t), r(t+1), ..., r(t+n) should be written as prod((1+r(t:t+n))-1. You can decide how each r(i) is to be computed. Thanks Ernie for all the sharing. As a starter I found that the biggest challenge is to find a reasonably cheap market data source, given that I have no profitable strategy to fund it initially. Thanks for the link I will check it out and see if it is applicable to myself. Without the 1ms before close data, do you think we can use a probabilistic approach to estimate a worse case scenario? If you fund a small account at IB, they will give you free market data. You don't need to test with auction data in the beginning - just find a profitable strategy with consolidated data first and then verify with paper trading on IB. I don't think you need to waste time with probabilistic approach to get around the auction data issue: it won't be right in any case. Coming back to the question above about computing returns for overlapping portfolios. Just to make sure I understand. So if you have a holding period of k days and you take new overlapping positions every day, you would suggest to use number of shares instead of portfolios weights? That is, track the number of shares for each security together with overall implied market value of the portfolio to compute implied portfolios weights each period? Yes, if you don't want to rebalance your portfolio everyday, that's what you have to do. you said that the best way to get historical FX data is asking your broker for it. Are you able to download historical FX data from IB? And do you need to use the TWS API in order to do get this data? Sure, we did download IB's FX data, but one can only do that via their API. Many academic papers I read compute turnover as sum(abs(w_t - w_t-1)). But doesn't this ignore the change in w_t-1 over the period? where r_i is the return on security i and r_p is the return on the overall portfolio. This also means that instead of using number of shares, one can update weights on existing positions with the above expression. If w_t represents the number of shares of a stock, then indeed the turnover is abs(w_t-w_t-1), but then you need to multiply by the price p_t to compute the turnover in $. If w_t represents market value, then this expression is incorrect. Turnover is used to measure transaction cost. Your second expression is incorrect because the growth of market value due solely to market movement does not incur transaction cost. Referring to your last paragraph. Say my signal suggests a portfolio weight of 0.60 for security i at time t-1. If security i has a higher return than your overall portfolio return over the period t-1:t then its weight has increased to say 0.65. Now suppose your signal at time t+1 suggests a weight of 0.60 again. Then my turnover at t+1 using portfolio weights will be sum(abs(0.60-0.65)). So in this case, the growth in the market value of the stock leads to turnover at t+1 for any signal weight different than 0.65. Hence the turnover in $ is abs(w(t-1)*(r_p-r_i)). w(t-1)*(1+r_i)/(1+r_p). Ie the performance of the stock vs the overall portfolio. I get exactly the same backtest result if i use number of shares as we first discuss or this updating of portfolio weights. Maybe I don't understand fully what you are doing, or your notations. If a position has market value w(t-1), and its return from t-1 to t is r_i, how can it not be the case that the actual weight at t before rebalancing is w(t-1)*(1+r_i)? OK, great. Thanks for your patience. I find it a neat way of updating daily returns when for example your rebalancing period is monthly. Thanks for sharing a great information. You earlier alluded that it is not possible to make a portfolio both dollar neutral and beta neutral at the same time. Could you please expand on this? I don't see why, given that I have enough weights to satisfy the constraints. Yes, I stand corrected. If you have many stocks you can indeed optimize your portfolio under both constraints. When constructing a continuous futures series, I know a popular method is backwards ratio adjustment. Just want make sure: There is no look-ahead bias arising from this right? I guess you only change the level of the entire series so returns should be unaffected. Is this correct reasoning? There is a possibility of minor look-ahead bias with back-adjustment, which is why many professionals prefer not to use continuous adjusted futures series for backtesting. Interesting. Could you please expand on possible sources of bias and how professionals mitigate them? Backadjustment in futures means using the future price to adjust past prices: clearly there is a look-ahead bias. The way to remove this bias is to use the actual contracts to backtest, and manage the roll over to the next contract by buying/selling on the rollover day. Apologies my question is not related to your post. I want to hear your thoughts on neural networks. I know the quant-trading community has traditional dismissed NN as too black-box. But with recent developments in DNN, the field has furthered its understanding around network topology, alternative response functions, efficient ways to train large networks, etc. Do you think this could potentially be a powerful tool for recognizing patterns from the financial market? And yes what type of frequenties/asset classes would it be most suitable? I have been following your blog. I dont think there is a look ahead bias when using for example backwards ratio adjustment of futures. You just shift the level of the price up and down which does not matter if you work with returns. NN requires a large amount of data to avoid overfitting financial data. Hence it may be useful in high frequency trading. If you back-adjust futures prices by eliminating the return gap during rollover, you will create a price gap, and vice versa. There is no way to avoid both, and so both cases involve look-ahead bias. Hence professional futures traders stick to actual contract prices. I'm reading your book, at Page 14, you mentioned of continuous future contracts for arb trading. But, after reading what you replied above, saying that professional futures traders stick to actual contract to backtest, and manage the roll over to the next contract by buying/selling on the rollover day. If you have generated a vector of trading signals (buys or sells), you should use actual contract prices to determine the returns based on these trading signals. But in generating a trading signal at time t, you can back-adjust futures for all time t' <= t to create a continuous contract. In particular, if you want to run a Johansen test on spreads of different futures, the backadjustment should involve only additions. If your signal is generated based on ratio of prices, the backadjustment should involve only multiplications. thanks for the blog and information. About the 'CEF Premium Reversion' strategy I wonder if you have an explanation why the different price changes the outcome significantly? I understand that the price is different but why does it result in a disadvantage, in particular when you trade long and short positions? Any "white" data noise always inflates the returns of a mean-reversion strategy. (See explanation on p. 10 of my book Algorithmic Trading.) In fact, white noise is the best kind of noise for mean reversion. Consolidated stock/ETF/CEF data suffers from white noise, while primary exchange data does not. thanks so much for your quick reply! Now this makes sense and the book chapter helped. It seems like a discussion on mechanism of order matching. Though low-frequency data like day bar or month bar we backtest, matching a deal through tick data is a necessity. Correct? I don't exactly know what you meant by order or deal matching. My instinct tells me that my article isn't about what you are thinking. Ernie, I see your point on figuring out the correct open and closing prices in order to conduct a proper backtest. This is where I wanna make a suggestion of forgetting ohlc data, I find liquidity way more important of an issue unless you only trade 100 share or 1 contract positions. Volume based bars or tick bars which are constructed off 1min may be a little better. As an example you would trade 500 share bars, and if you need to execute at open you would take the worst price of the range or median price of 1000share bar range as your price of execution. (latter is better because in reality even if you tried to execute this 500 share trade you wouldn't have been able to within first bars range because that would assume you were only buyer).My point is all these back tests are pointless without tick data - period. Yes, your idea for using a volume bar at the open is certainly a good alternative of using the official open price, which often has limited size. However, even though that auction size is limited, it isn't quite limited to 100 shares. You can typically trade at least $200K to $500K order depending on the market cap of the stock without moving the auction price. Hi, I'm following your book codes (strategy "Buy on Gap" pg.93-96) on Matlab but as I'm using the 2016 version I had to rearrange some of your old functions (i.e "lagmatrix" instead of "lag" and "tsmovavg" + "movstd" instead of your personal functions for moving averages and moving standard deviations"). Anyway...I honestly find very different results from yours even if using the very same data! 1) You calculate 90 days moving average for daily returns (close to close) and say that we have to consider only (today open/yesterday low) returns < than the 1 standard deviation from 90 days movaverages just computed. But...in your code you make the previous day low - 1 standard deviation. Isn't it wrong?? 2)in the second condition you say that today low must be < than 20 days mov.average of closing prices. So, why in the code I read ma= moving average of close to close returns???? So only those days with op < buyPrice will be used. 2) Indeed "open prices to be higher than the 20-day moving average of the closing prices. " Note ma is NOT computed as moving average of returns. It is computed as moving average of close prices. Yes you're right about the point 2): the moving average is computed over closing prices and not return (sorry yesterday I was clearly done with my mind!!). The point "1" instead...I'm still not sure about it: Shouldn't it be: retgap < stdretC2C90d? Anyway, I'll work on it. The real problem is (for the previous and future strategies I'll read on the book) working with different versions of Matlab (as I can't use any longer function as "lag" etc.) but I thought I managed to change functions in a way to get close to your results. I was clearly wrong (my Sharpe Ratio is only 0,63 compared to your 1,5 and my APR 0,0048 instead of 8,7%!!!). I don't know where, but I've failed into coding. So, is there by any chance, an update version of this book's Matlab code? Thank again for your attention and your patience! I believe you can substitute op(t, :) < buyPrice(t, :) with retgap < -stdretC2C90d, but note the minus sign. The function lag is in spatial-econometrics.com which you can download for free. But lag(x) can be substituted by backshift(1, x), and backshift is a function from epchan.com/book2. Matlab is mostly backward compatible. If you find a piece of code doesn't work, most likely it is because you need to download some utility functions from my website or from spatial-econometrics.com. Believe it or not, I made the same changes before your reply!!! Well...to be honest, "almost" the same: I forgot the "minus" sign. Ironically I got a far better APR (more than 20%) while Sharpe almost equal. Unfortunately I still have values too far from yours. It's clear that depends on functions and by some changes I made. No problem, I think for the moment it's more important understand the "meaning" of a strategy. So now I can go on with the book. You sum returns for every day in order to have a final column vector pnl. It's all ok but...summing percentages from different prices shouldn't require us to multiply these percentages for the opening prices? I mean, that way we have the absolute value we're really gaining/loosing. Or maybe I'm doing confusion because I don't even understand why dividing for 10. Anyway, I abused of your patience so thanks again for your help. Yes, my total returns are an arithmetic sum, not a compound return. This is useful for Sharpe ratio calculation, or if the trader wants to bet a fixed amount of capital each day. However, even if you were to compute compound return, it isn't correct to multiply the price with the returns. They are totally different animals. Compound return formula would be just cumret=cumprod(1+retO2C)-1. Are you saying that open/close prices are different on yahoo or google than they are on Bloomberg HP page? Is this just the case in the US? In your second example is 5bps an accurate assumption of trading costs, did you find there was any market impact, has it continued to perform well 3 years later? Yes, prices on Yahoo and Google *may* differ from that on Bloomberg IF you select the primary exchange prices on Bloomberg. Not all prices on all stocks differ every day, but they do occasionally for some stocks. This is applicable only to US exchanges. I cannot speak for other exchanges. 5 bps is a reasonable cost estimates for S&P 500 stocks. It is difficult to measure market impact on open and close prices. I haven't backtested this strategy recently, so I don't know if it continued to perform well.